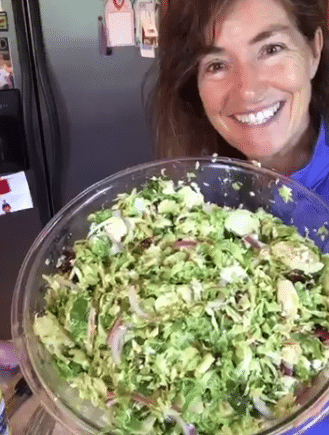 Shred Brussels sprouts using the shredding blade of a food processor or slice thinly with a knife.Place Brussels sprouts in a large bowl and combine with chopped bacon, red onion, cherries, almonds and optional Gorgonzola cheese. Whisk together vinaigrette ingredients. Add vinaigrette immediately before serving and toss well to coat.